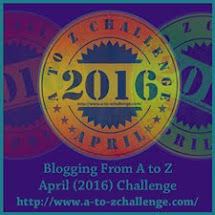 The A to Z Challenge kicks off on Saturday! 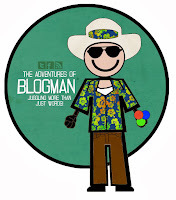 Are you ready for a month of going boldly where no bloggie or trekkie has gone before? My theme for 2017 is Star Trek culture, technology, people and places. 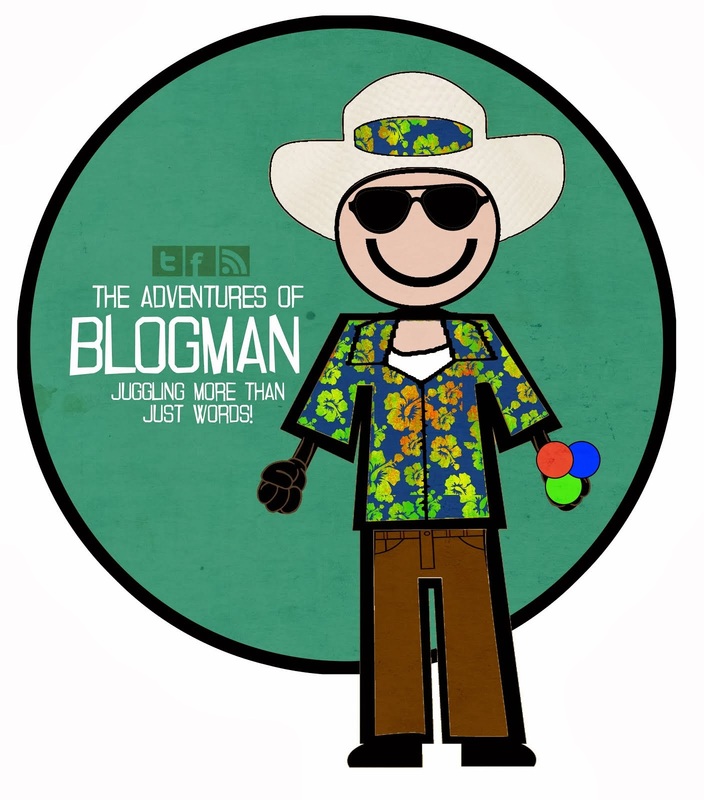 Blogman Arlee Bird has an army of A to Z co-hosts with fascinating rules to set our phasers on fire. If any Klingons turn up fire a full spread spread of torpedos to trekkinate!!! terminate haha - get it? Jason Isaacs is Captain Lorca but who is he? At Pinewood Toronto Studios, the CBS crew is boldly exploring the Prime universe with the leader of USS Discovery NCC 1031. CBS is keeping Discovery's new crew, new villains, new heroes, and “new worlds” curiously under wraps. Isaacs played Lucius Malfoy in the Harry Potter sequels also starring in the blockbuster movie "Fury" yielding 211 million at the Box office. So here's a fun photo of Discoveries cast celebrating James Frain’s birthday. Speculation over Discoveries star lead will have us guessing this year. Who's in charge? Isaac or Sonequa Martin-Green or Michelle Yeoh? 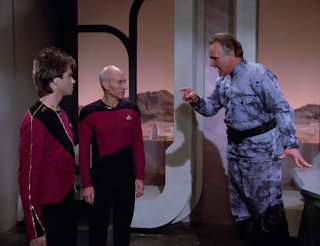 - Captain Lorca or Lieutenant Rainsford or Capt Georgiou? Exciting and beautiful, Rainsford is trek's first female, African-American lead for a Star Trek series. Mary Chieffo (L'Rell), Mary Wiseman (Cadet Tilly) and Michelle Yeoh (Captain Georgiou) are terrific recent additions. How sensational will the discovery crew venture to get you hooked on the shows futurism? 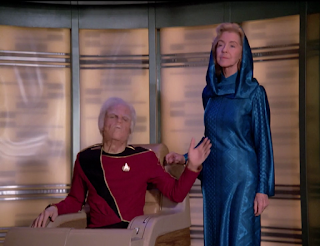 Star Trek's impressive brand new space babes will do everything to catch and delight new audiences. Are you ready to hand over your cash for the newest, latest CBS All Access adventure? 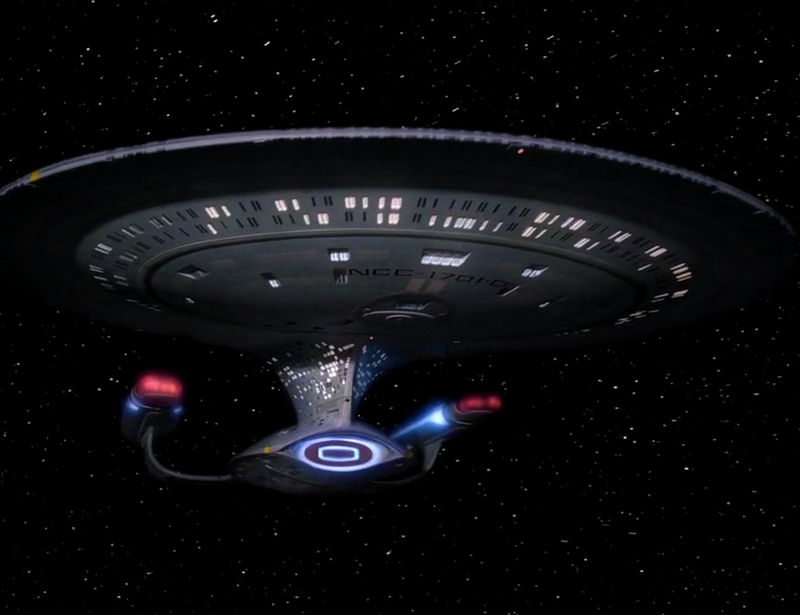 But, no Network TV Trekkies, however, Netflix is underwriting the entire sci-fi series. 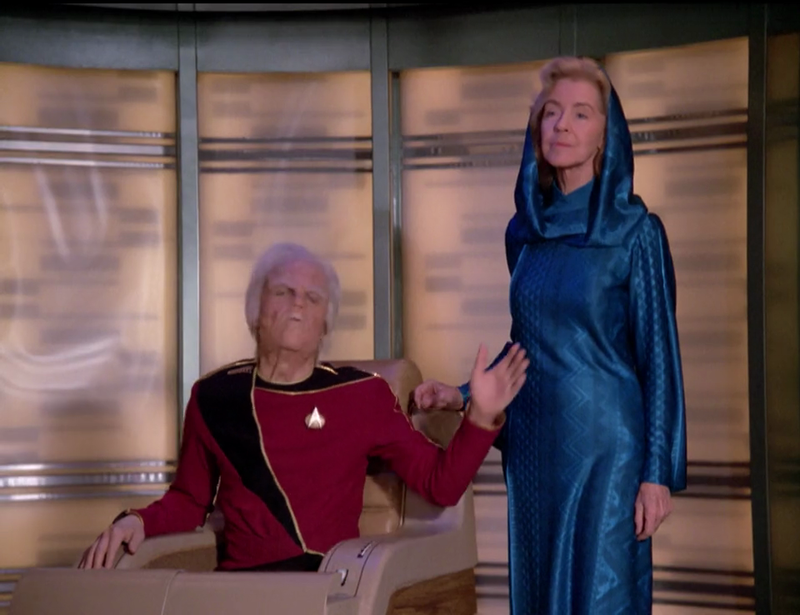 Meanwhile, to recap, Star Trek Discovery is 10 years before Captain Kirk's five-year mission. To date, five starship captains have been our friends, our protectors, and guides through 50 years of Star Trek. 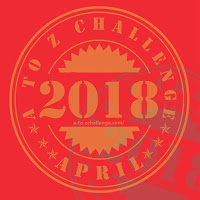 Were you along for the awesome journey? Which Star Trek, Sci Fi series do you watch? 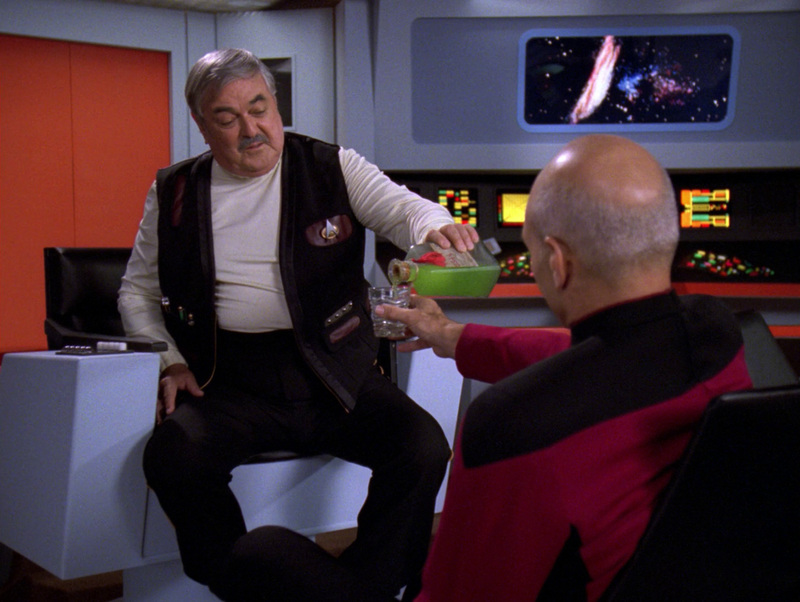 What would you say if you met one of the five "Star Trek Captains?" Who is your favorite character, captain or alien race? Which Federation starship is your favorite? Do you have CBS ALL ACCESS or NETFLIX? Will the CAST of the USS DISCOVERY open your hearts and wallets to watch the fun? Who said “We are Star Trek family! Wakey, wakey, ahh ahh Nooooo, please! Who doesn't want to dream about STAR TREK?, with Earthers and Alien species exploring the universe in futuristic spaceships searching for M-class planets. It's all too fantastic to be a dream. I reluctantly wake up bleary-eyed, it's Monday morning, oh Gawd Nooooo... time for work.....that place... my real, get me out of here life....ugh....I drag the bed covers back over my head and grab another 5 mins aboard my starship.... But searching the stars could happen someday, right? So here I am... Captain of the USS Nightfall NCC 1703. While proceeding towards the most beautiful and nearest star system, Alpha Centauri, why not analyze Star Trek's unique system of warp travel. Warp One being equivalent to, The Speed of Light exactly 186,282 miles per second which is like Duh what? How does that work? Now pointy ears is piping up. VULCAN SCIENCE OFFICER: All indications are given our current impulse speed, I estimate four years on our present course to reach the nearest star system Captain. CAPTAIN: Come again? Is this Alice and Wonderland? Warp Speed? VULCAN SCIENCE OFFICER: Non-Operational Captain. Terraforming, uninhabitable worlds under 21st-century conditions will be a feat of engineering. The Earth Federation enforces very strict regulations to protect indigenous lifeforms. CAPTAIN: "Duh...what? Doubletalk, I want answers." I reply. VULCAN SCIENCE OFFICER: At our current reduced velocity of less than the speed of light. It's looking hopeless Captain. Warpspeed is impossible. VULCAN SCIENCE OFFICER: It may not be possible to deliver terraformers to their designation safely. The amount of time we have to traverse the galaxy is limited. In order for me to complete the Kolinahr disciplines at the Gol temple of Vulcan purging the last of my emotions, we'd likely risk affecting the natural balance of order in the universe. VULCAN SCIENCE OFFICER: Such a journey might in fact, take many hundreds of years into the future at sublight speed..... or delve into the past if we had warp speed. 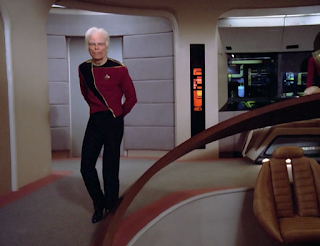 CAPTAIN: Our descendants making the same trip might not even remember why we're making the trip in the first place. VULCAN SCIENCE OFFICER sQuite logical Captain. CAPTAIN: Well, I'm glad we agree on something. So that leaves the Slingshot Effect around the sun doesn't it? So there you have it trekkers. Is this a dream with a dream? Well, you decide! Maybe I had too much beer, lol. but you'll never guess who turned up! Our Klingon Warrior friends no less, haha! These guys wanted to know how in blue blazes I ended up on the moon all by myself drinking beer. Anyone care enough to figure out how I drank the beer? Qapla! Where would you have photo-shopped the Klingon Bird of Prey hovering by Earth's gravity. 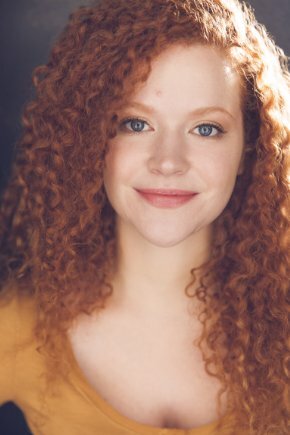 How would you rate this story as an entertainment piece? HERE'S TO YOU LADDIE AND LASSIES, ITS UH, GREEN. 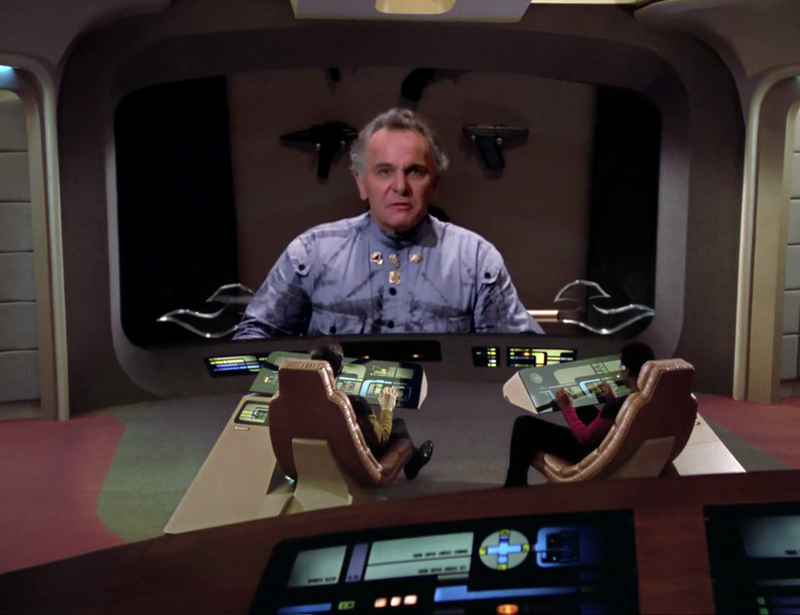 STAR TREK TNG "TOO SHORT A SEASON"
Federation legend Admiral Mark Jameson (Clayton Rohner) has negotiated many peace deals between alien species across the galaxy. The natives of Cerebus II were mighty grateful... but time has not been kind to Jameson whose plagued with Iverson disease - has no choice. He swallows a magic elixir. 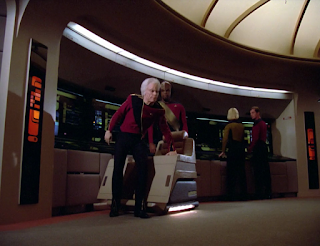 When a hostage situation springs up the USS Enterprise NCC 1701 speeds to Mordan IV. Legend has it - Jameson masterminded peace on the Mordan homeworld by supplying the planetary leader Karnas and opposing sides with a very simple solution. But what was that I hear you cry? I bet you're hooked now! 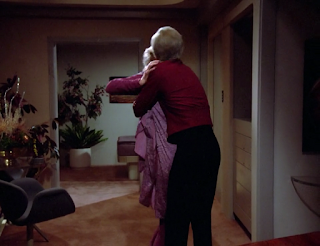 Jamesons idea of the Prime Directive wasn't exactly above board either. We later discover Jameson is having a lot of chest pains. So what exactly is going on? Not even Dr Crusher's tests or Counsellor Troi can figure Jameson out who is slowly beginning to get stronger and younger. 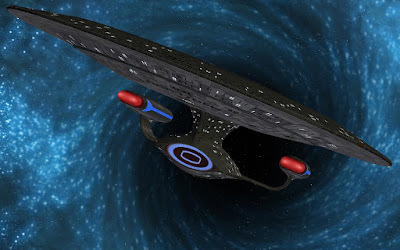 The real mind twister occurs when the USS Enterprise-D approaches the Idini Star Cluster near Mordan IV. Captain Picard lets the Admiral take the conn. 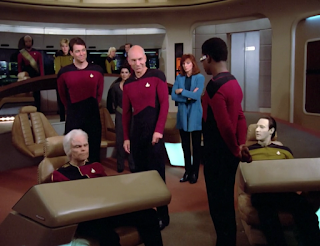 The entire bridgecrew are stunned when the old guy stands up and walks down to Geordi's Conn station. Dr Crusher is beside herself. Iverson's is a crippling ailment. No-one ever recovers! CRIPPLED JAMESON,.BLINDMAN GEORDI AND ANDROID DATA. NO-ONE HAS A CLUE, HEHE. At 85 years old, heres one guy no longer suffering from amazing "body changes" with wife Annie (Marsha Hunt), flipping out in classic big style. The fun begins when he finally spills the beans to her. The poor lass almost has a meltdown but I guess the ol guy realises he's in deep sh*t because so much is on the line. JAMESON: Annie, I did it for us. ANNE: Oh, I'm sure you believed that, until you had a chance to head up a mission, to command again, and then you just upended the bottle or whatever it was, and damn everything. Did you think about me at all? JAMESON: I obtained enough of the dosage for both of us. ANNE: But you never asked if I wanted it. It's just like you, Mark, to assume that what you felt was right was the only answer. JAMESON: But it was the right answer for me. It was killing you, having to take care of an invalid. Annie, what good was I to you? We can be together again. 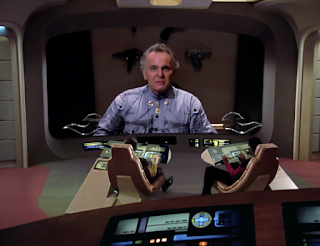 The planetary leader Karnas (Michael Pataki) wants old man Jameson to beam down on the double. Karnas won't speak to anyone else!!! Forget about it. So when Picard, Crusher and the young Jameson beam in - all hell breaks loose. Karnas has a frenzied fit of rage. MY REVENGE WILL BE SEEING YOU LIVE LIKE THIS. SUCH PAIN. KARNAS: This story you are telling is unbelievable. Jameson is a man of more than eighty years, not this. 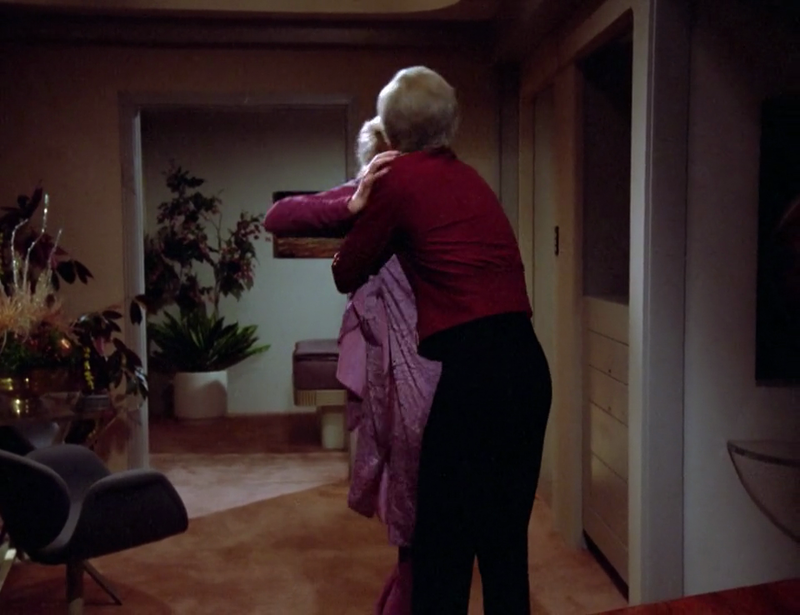 I want that old man, Picard. I want to show him this world he helped to make. The scars on old soldiers' bodies. It turns out Karnas took the hostages to reel Jameson in like a fish. But will Jameson take the bait and go in all guns blazing? What did he do to make Karnas so mad four decades ago? I'd be ruining the end if I blabbed, so have a guess or watch the fun and come back! What really happened on Mordan IV 45 years ago? If you discovered one vial of youth serum would you swallow it, try and replicate it, sell it or keep it a secret? 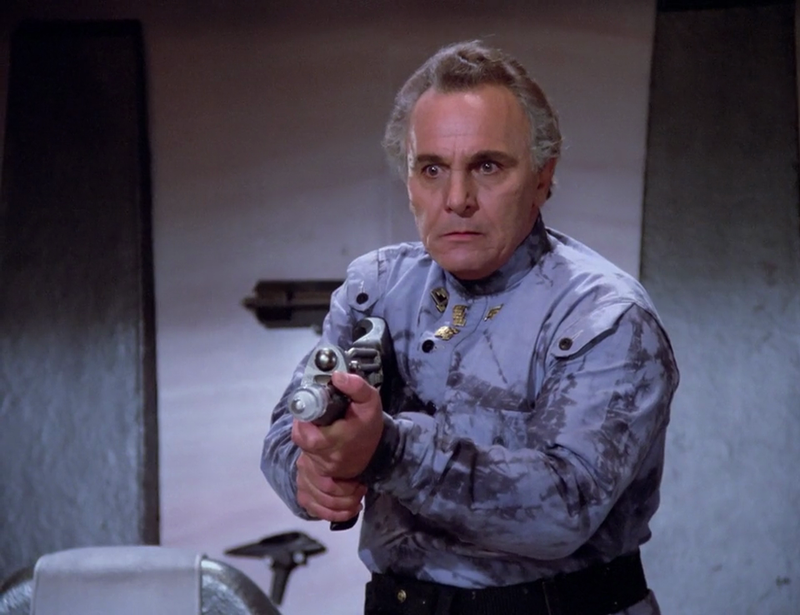 Admiral Mark Jameson was a Starfleet Mastermind Negotiator. What say you? Yay or Nay?